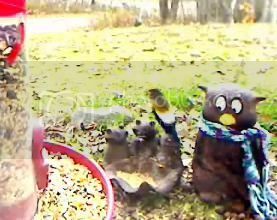 A male Evening Grosbeak sits on the seed bowl..
Today as I sat in my living room, I noticed an unusual bird in the trees above the Birdcam. Upon further inspection, I saw that there were three of the beautiful birds around the feeder. I frantically snapped a photo with the cam, but this was all I got...the backside of the male (he was with two females). It took a little investigation, but I figured out that the three unusual visitors were Evening Grosbeaks. They aren't terribly common here, but there are a few sightings from time to time. How exciting to have yet another species spotted on the cam! I hope they visit again, and I hope to get a better photo!